Here's a test of observation. 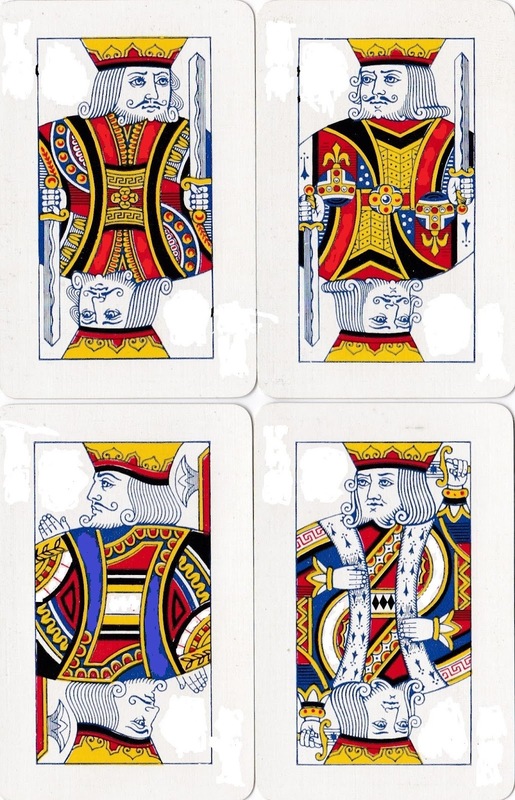 You'll have seen these four Kings from a pack of cards literally thousands of times, and they're always the same, no matter which company manufactured them. 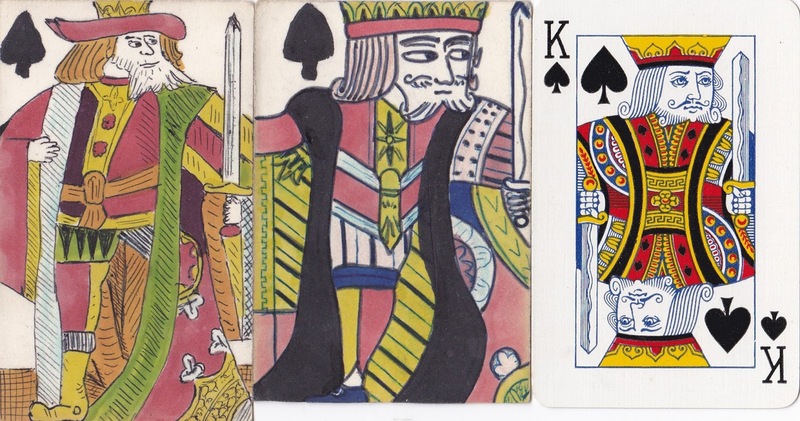 So can you recognise which King is which, now I've removed the suit symbols? The answer will emerge later. But how did they come to look like this? We saw in the first part of this essay how the four suits with which we are familiar appeared in France, probably in the 14th century, and the design of French court cards has changed little over the centuries. 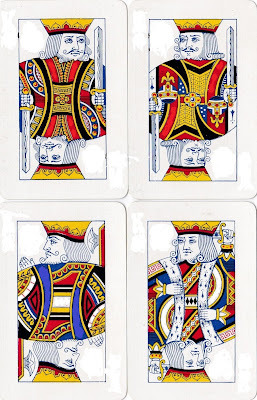 Our court cards copied the French system in having a King, Queen and Servant (called a Knave until the 20th century, but now better known as a Jack), followed by 10 pip cards. "Th' embroidered King, who shows but half his face"
The rest, his many-coloured robe concealed"
It it clearly the King shown above who is being described. And, of all monarchs, only grasps the globe?" 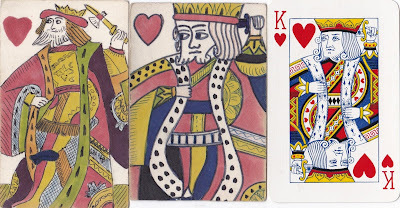 The King of Clubs is still the only King to have an orb, though nowadays it usually floats unsupported in front of him. Only in the pack which Alfred Cook used to make for Woolworth's did the King of Clubs retain some vestigial fingers under his orb! 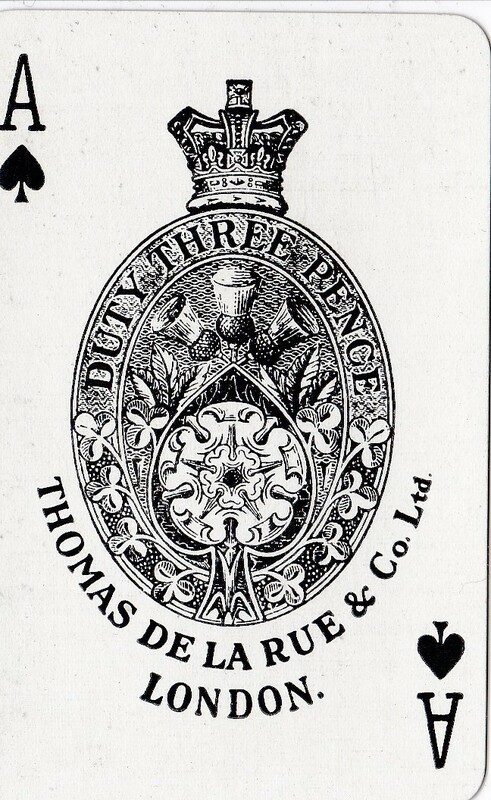 In the 19th century the court cards "lost their legs" and were turned upside down. It's easy to work out why this happened. 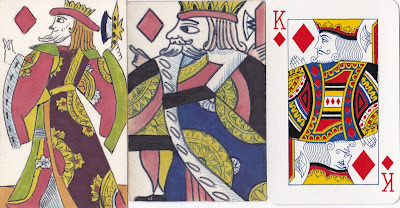 With only one suit symbol on each card, a player who was dealt his court cards "legs upward" would have to turn them around to find the symbol, thus giving important information about his cards to his opponents! 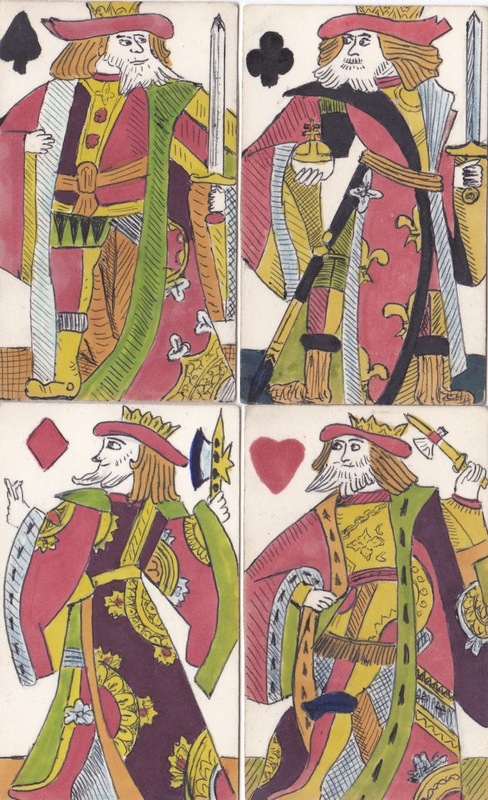 So our court cards evolved, as shown here, left to right, from 16th century France to late 17th century England to the present day, becoming evermore less lifelike and more diagrammatic. These are three of the Kings, but the Queens and Jacks followed exactly the same path. 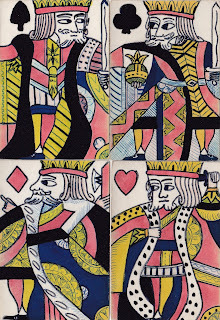 The King of Hearts has had his rather inappropriate little tomahawk changed to a sword held behind his head - though it clearly has a very short blade! In 1805 there was even a case in which an unfortunate man named Richard Harding was sentenced to be hanged for forging the Ace of Spades! That's pretty cool. Now I need to reread part 1. There is one question that occurs to me Peter: why are all the kings holding their weapons in their left hands? Come on, Dennis! 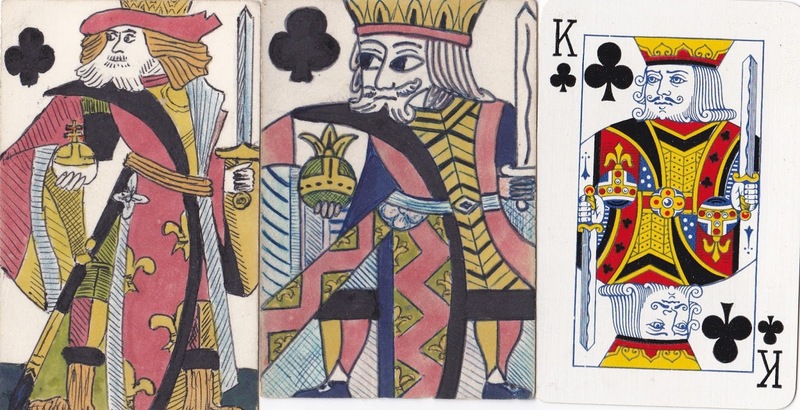 If the suit symbol is in the top left-hand corner of the card, and the kings are facing forwards, they must of necessity hold their weapons in their left hands! 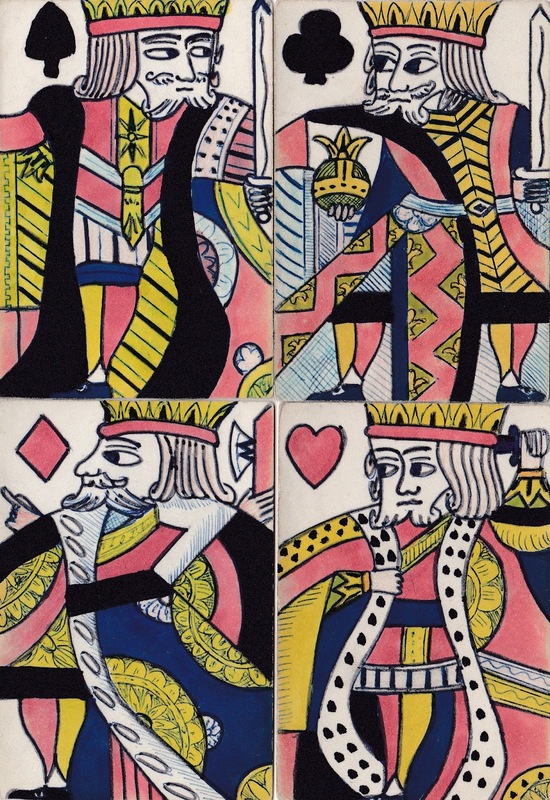 Actually, in the older packs, and in some American packs even today, some of the queens and jacks have the symbol in the top right corner. So what you're saying is that the left-handedness is merely an artifact of the design. What I was alluding to was that they wouldn't be much good at fighting. 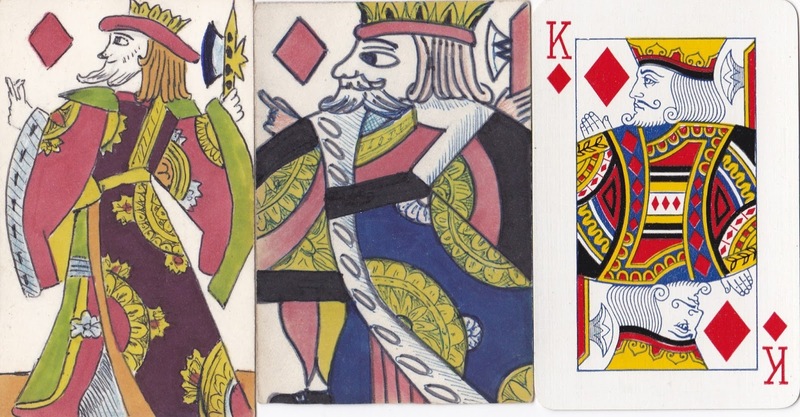 By the way, can you tell me why the ace is considered the highest card in a suit, when intuitively it should be the lowest. 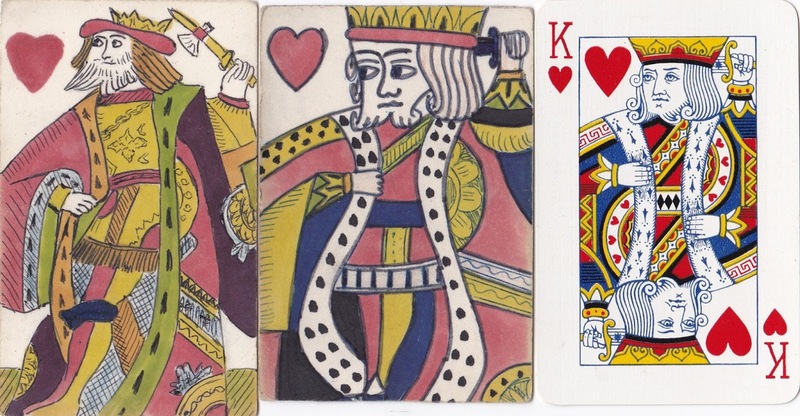 Actually, if you look carefully, you'll see the King of Diamonds is right-handed. He's the only one! I love this blog. I'm from Texas with only a mediocre record in academics, but when I was 10 my mother got me to read Suetonius's "Twelve Caesars", I asked why and she said the pages dripped with blood, I've been hooked ever since on those guys and almost everything listed to the right. I'm glad I stumbled across this place. 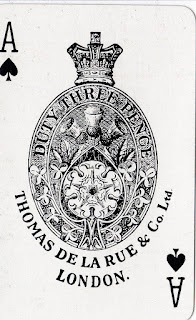 Just to cause further confusion, in Ombre the Spades and Clubs aces were high, but the Hearts and Diamonds aces were low! Of course, in Pontoon the ace can be either high or low, as desired.